Exercise control over your next B2B campaign with our personal trainer email list, which can help you flex your marketing muscles and reach a wider group of better sales leads. 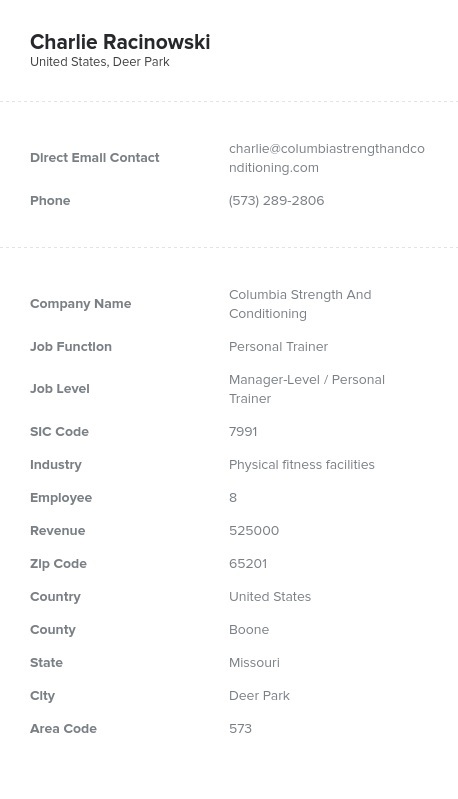 Personal trainers' emails and vital contact information are all packed into this one database. Make sure your next email marketing campaign packs a punch! Target those working in and running numerous gyms all in one swoop with this email database of personal trainers from Bookyourdata.com. We've crunched all of the data you need into this one list, which is a pre-made product that's ready for you to download and start using right now. Personal trainers at gyms, organizations, and fitness clubs work hard to make sure you're working out using the right exercises at the right times. These are excellent small-business contacts, as they all often share expertise in anatomy, exercise, and overall health. They want to bring their own customers the best products possible to help them on their road to optimum physical health. If you are flaunting a vitamin, diet food, exercise aide or tool, or new health solution, this personal trainer mailing list can be the most powerfully efficient way to get your product out to the masses. Make sure personal trainers everywhere can recommend your brand by mailing free samples, call them directly, or email leads to let them know about your products or services. Don't worry; we've included postal addresses, emails, and more all in this personal trainer email list. Get more exercise professionals to buy your products by showing it off to personal trainers. Emails, phone numbers, and addresses are all available now! Download them today.